Just before Frankenstorm Sandy hit the coast of Maryland I brought home a container of lamp fuel from Weems & Plath for my DHR Berth Oil Lamp just in case we lost power. And we did lose power for three days. I filled the lamp 2/3 full and it burned for over 15 hours during the course of 3 days and never needed to be refilled. The burn time for this lamp is approximately 50 hours. The burn time is calculated by measuring the amount of oil that the reservoir holds plus the surface area and length of the wick. All approximate burn-times for each lamp that we carry are listed on the website. I used the Berth Lamp at the dining table and on the kitchen counter while preparing food. True to its tagline, this liquid paraffin burned clean, odorless, smokeless and sootless. For more info click here. Clean burning liquid paraffin is the only fuel that Weems & Plath recommends for oil lamps. Until recently, Kerosene was the standard fuel for oil lamps in the USA. The term, kerosene, is so common that consumers mistakenly use it to describe any lamp fuel on the market, much like the term Kleenex is used to describe all tissue types. There are significant differences in the types of lamp fuel available on the market. Based on my online research it’s easy to see why people become very confused about the differences because names are used interchangeably and because there are many different grades of lamp fuel, all called Kerosene or paraffin but with different characteristics. I read a trail of posts about which lamp fuel is best on cruisersforum.com, and it was clear to me that the answer is… not clear. In England for instance, Kerosene is called Paraffin. Wikipedia talks about a guy in Canada that developed Kerosene from coal in the 1840s and a guy in Scotland, at about the same time, developed something similar that he called Paraffine oil. That’s the origin of the confusion! I’m not going to pretend I’m an expert on lamp fuel. I can only say that the grade of liquid paraffin that Weems & Plath provides is a highly refined blend of liquid petroleum’s formulated to standards above other lamp fuels. It does not degrade over time as some fuels do and because there is no smoke or soot, the chimney rarely needs to be cleaned. I have spoken to many sailors who come to our Annual Tent Sale to stock up on lamp fuel. They tell me that kerosene does have an odor and does emit some amount of smoke. They admit that Kerosene is usually less expensive than our liquid paraffin, but they have learned that cutting costs on lamp fuel is not the way to go on a boat. Fumes and smoke are definitely NOT something you want to deal with in close quarters gibt es viagra ohne rezept. The other point they make is that if kerosene spills it will support a flame front. In other words, it will ignite. Paraffin will not. 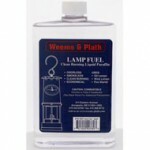 Stock up on Weems & Plath lamp fuel for all your oil lamps. You won’t be disappointed in the performance! We have been ordering lamp oil on the internet because we were disappointed in the quality of what we found locally. We’re glad to know we can find what we need right nearby at Weems & Plath. Thank you, Cathie!